New Zealand will play 3 Tests and 5 ODIs during the India tour starting Nov 4, 2010. India won the 3rd and final Test match by an innings and 198 runs, handing New Zealand their fifth heaviest innings defeat in history, at Nagpur. It was also India's third-biggest win. New Zealand were all out for 175 in their second innings. The hosts won the three-match series 1-0 after the first two tests ended in draws. The 3rd ODI between India and Australia at Goa had the same fate as the 1st ODI in Kochi. It was abandoned due to bad weather without even one ball being bowled. India had a clean sweep against the visitors, winning the Test series 2-0 and the ODI seies 1-0. First innings double century-maker Sachin Tendulkar scored the winning runs in India's seven-wicket victory Wednesday over Australia to take the two-test series 2-0. It was India's first victory at the M. Chinnaswamy stadium in 15 years.Australia was bowled out for 223 earlier Wednesday, setting India a target of 207 to win. 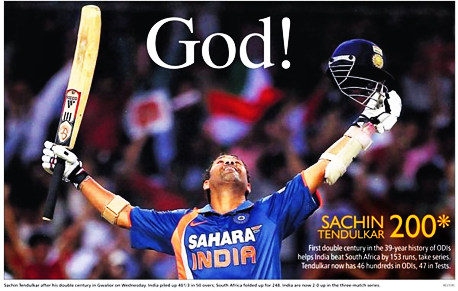 Tendulkar, who scored 214 in the first innings, took his series aggregate to 403 runs, at an amazing average of 134.5. Rahul Dravid, who shared in a 61-run unbroken fourth-wicket partnership with Tendulkar, remained unbeaten on 21. Playing his first test and promoted to bat at No. 3, Cheteswara Pujara set the pace of the innings with a 72 with seven boundaries.With this win, India have consolidated their position at the top of the ICC Test Championship table, while Australia have dropped behind England to fifth position after racking up two losses - in Mohali last week and Bangalore on Wednesday - to Mahendra Dhoni's men. India will play two tests against Bangladesh after the completion of the tri-nation one-day international series featuring Sri Lanka in January, 2010. Indian left-arm seamer Zaheer Khan claimed three wickets in four balls in a dramatic spell at Dhaka as the home side collapsed from their overnight score of 228/3 to 312 all out in the first over after lunch. Khan added four more wickets to his three overnight to end with a career-best seven for 87 in the second innings and 10 wickets in the match. India knocked off the two runs required to raise a comprehensive 10-wicket victory with a full day and close to two sessions to spare.Zaheer Khan won both the man of the match and the man of the series awards. With this win, the Indians made a clean-sweep of the series, winning it 2-0 after also winning both their ODIs against Bangladesh in the tri-series earlier. India on Thursday won the first Test against Bangladesh at the Zohur Ahmed Chowdhury Stadium by 113 runs. Chasing an improbable 414 runs for victory, Bangladesh were bowled out for 301. Bowlers Amit Mishra (4-92) and Ishant Sharma (3-48) shared seven wickets. The only consolation for Bangladesh was an entertaining 101 by wicket-keeper Mushfiqur Rahim. The second and final Test starts in Dhaka on Sunday. Bangladesh will host a tri-nation one-day international series featuring India and Sri Lanka in January next year in Dhaka, the BCB has announced. Bangladesh take on Sri Lanka in the opening match on January 4 and the two top teams will face off in the final on January 13. Each team will play the other twice, all day-night games. Sri Lanka won the 'Idea Cup' tri-nations series by beating India in a one sided ODI finals by 4 wickets. Batting first after losing the toss, India were reduced to 16/3, losing Gambhir (1) in the first over, Virat Kohli (2) and Yuvraj Singh (0) in quick succession. Dhoni (17) and Sewag (42) tried to resurrect the innings, but also fell to the pace of Man of the Match Nuwan Kulasekara (4/48) and Chanaka Welegedara (3/53). India were struggling at 60/5 in the 11th over, before Suresh Raina (106) hammered a brilliant ton to help India towards 245 in 48.2 overs. It was his first ODI century against serious opposition, the first two coming against Hong Kong and Bangladesh.Sangakkara (55), Dilshan (49), Jayawardene (71*) and Samarveera (27) lead Sri Lanka to victory. The fifth and final ODI at the Kotla, on Sunday, was forced to be abandoned after 23.3 overs as the pitch was deemed too dangerous to play on. Sri Lanka had toiled on the tricky surface to post 83/5, after being put in to bat in foggy conditions, before play was abandoned. Zaheer Khan provided India a dream start, cleaning up the in-form Upul Tharanga with the first delivery of the match. As the pitch turned nasty, Dilshan was struck on the elbow by Nehra's second delivery in the tenth over. Sanath Jayasuriya was also struck on the shoulder by Zaheer first and then Sudeep Tyagi. Tyagi, who made his ODI debut, finished with figures of 6.3-1-15-1. His lone wicket was that of Kumar Sangakkara who made one. Soon after he was out, Sangakkara decided he had enough and called his batsmen back to the pavilion. There were mild, isolated protests which spread and took a violent turn when it was announced at 12:30 pm that the match has been abandoned.The Board of Control for Cricket in India responded to the fiasco by dissolving its grounds and pitches committee, while the Delhi District Cricket Association apologised to fans and spectators and offered to refund the cost of tickets. Haroon Lorgat, the ICC's chief executive, said that Delhi would not be punished for the abandonment before an investigation was held.